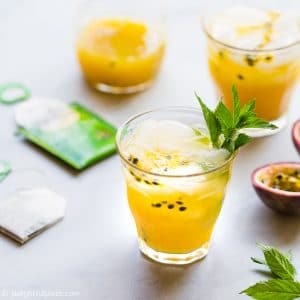 This Passion Fruit Iced Tea is very tasty and refreshing with a relaxing sweet aroma from passion fruits. 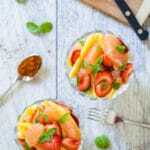 It is easy to make with 5 simple ingredients and no refined-sugar. 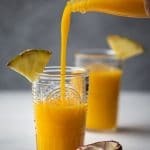 A perfect drink to beat the heat in the summer! 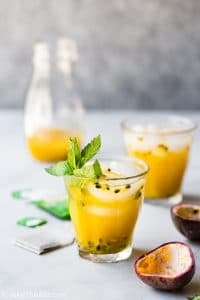 Some of my most favorite Vietnamese summer drinks are made with passion fruits. These small fruits are widely grown in tropical regions in the world. In Vietnam, we call them “chanh leo” or “chanh day”. 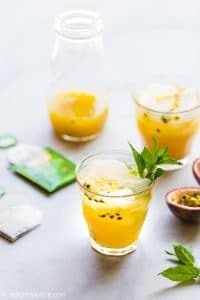 If you are looking for a thirst-quenching summer iced tea, definitely give this passion fruit iced tea a try. The sweet and relaxing aroma together with the slightly sour taste of this fruit cool me down quickly on hot summer days. I admit that I’m not very good at choosing passion fruits :). I try to choose ones that are purple/red and heavier than their size with wrinkles which indicate they are ripe. However, I sometimes still run into some that don’t have a lot of juice/pulps inside. My solution for that problem is to cut open more passion fruits until I have enough :). This Passion Fruit Iced Tea is definitely my most favorite fruit iced tea this summer. The Vietnamese translation for this drink is “tra chanh leo” or “tra chanh day”. All you need to make it are green tea bags, passion fruits, honey, water and ice. You first need to brew some tea and then add honey to sweeten it to your liking. While cooling the tea, strain the passion fruit pulps to get the passion fruit juice. Once the tea is cool, add the passion fruit juice and a lot of ice, mix and that’s it. The tasty and refreshing passion fruit iced tea is ready to be served! The seeds of passion fruits are edible but we don’t need them in the tea. I add some seeds to the tea just for garnishing purposes. 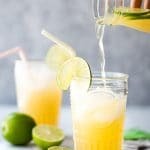 This Vietnamese lime iced tea is also an excellent drink to relieve your thirst. This refreshing passion fruit iced tea is very refreshing and tasty with a sweet aroma. 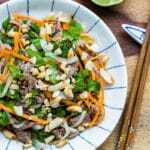 It is easy to make with few simple ingredients and no refined-sugar. Perfect summer drink to beat the heat! 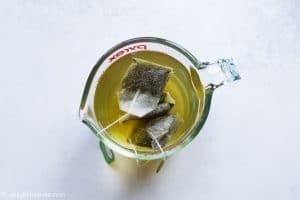 Add 3 tea bags to 2 1/4 cups of hot water at 175F. Brew for 3-4 minutes or to desired strength. Discard tea bags, add honey and stir. Set aside to cool or chill in the fridge. Cut open passion fruits, scoop out the pulps and strain to remove the seeds. Use the back of a spoon to help extract the passion fruit juice. 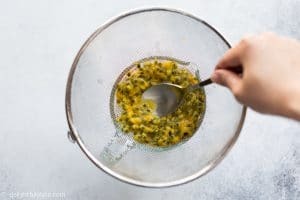 We need about 1/2 cup of passion fruit juice. Add passion fruit juice to the tea and stir to combine. You can serve immediately by adding ice to serving glasses and pour the passion fruit tea into each glass. Funny enough that I just had it at a Vietnamese restaurant last weekend. It was sooooooo refreshing! Can’t wait to make this at home! Oh really :D? Glad to know you liked it :D.